International Commercial Arbitration and Mediation in UNCITRAL Model Law Jurisdictions covers all the information that is needed when contemplating arbitration or mediation in one of the Model Law countries. This new edition of a classic text is so extensively revised and updated as to constitute a new book. However, it retains the tried and tested article-by-article structure of the previous three editions: it covers all the information needed when contemplating cross-border arbitration or mediation and enables a practitioner to ascertain what to expect in each jurisdiction. It remains the only book that provides a complete overview of all the adopting jurisdictions, highlighting the details and comparison charts of the 111 jurisdictions that have to date adopted the Model Laws (including the thirty-one new jurisdictions since the last edition) with a description of the legislation in these jurisdictions counterbalanced by court rulings to demonstrate how matters are dealt with in everyday practice. The popular adoption chart matrix unique to this book has been further enhanced and updated. which jurisdictions can be safely recommended in arbitration or mediation clauses in international commercial agreements. Both of the Model Laws are reproduced in full in Appendix. With an examination of each provision’s legislative history as well as national and subnational adoptions of the Model Laws, this edition provides a complete picture of global practice in international arbitration and mediation as it exists today, taking full account of emerging trends in the enactment process and in case law. Business people who agree to arbitrate in one of the 111 recognized Model Law jurisdictions can rely on a secure minimum of rights in the arbitral proceedings and run less risk of being surprised by unwelcome peculiarities of local law. 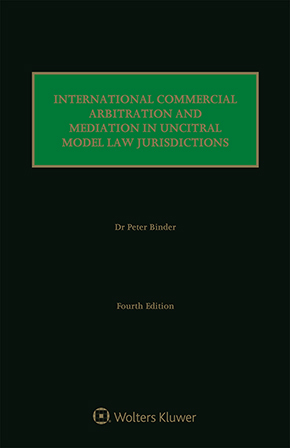 International litigation lawyers, arbitrators, specialist arbitration practitioners and in-house lawyers who are considering arbitrating or mediating in one of the many jurisdictions analysed as well as also academics in international ADR and national government officials dealing with cross-border trade will benefit enormously from this new edition.